Home /Blog/Single family home: Is it the best option for you? Single family home: Is it the best option for you? A single-family home is a vision as well as a brick-and-mortar reality for millions of home buyers. It embodies the American Dream. Remember, as a child, how “home” was always drawn as a single house with a white picket fence? In mortgage lending and real estate, a single-family residence is abbreviated to SFR. But can today’s homebuyers afford the SFR, and do tomorrow’s even want the SFR? Single-family residence: What is it? A single-family home is a unique real estate creation. Single family residence (SFR) means a structure maintained and used as a single dwelling unit for one household. The property includes the land under the home and usually a yard as well. What constitutes a single-family home? The SFR is usually freestanding and often surrounded by a yard. Each residence accommodates one household. Its systems are individual. If there is a garden or hot tub, it belongs to the family with title to the premises. It’s not jointly owned with neighbors. What about the attached single-family home? Single-family homes can share one or more walls with another dwelling unit and still be technically SFRs, according to the National Association of Realtors — as long they have direct access to a street and do not share heating facilities, hot water equipment, or any other essential systems. So attached single-family homes are definitely an option if privacy is not your priority. SFR ownership can be confusing because some condominium developments have units that are freestanding and not connected to each other at all — yet they are condos because that is how ownership of the land and facilities is set up. What is a single-family home vs a multi-family home? However, mortgage lenders consider multi-family or multi-unit homes differently — not in the same class as condos or apartments at all. They can have just two, three or four units. Anything more than four units makes building “commercial residential” and can’t be financed with a mainstream home loan. Owners of single-family residences typically have fee simple ownership, which means that you own the land on which your residence rests, and perhaps a yard. You own your walls and driveway and greenery and maybe even a private road. Owners of condos and co-ops and some townhomes get no land. If you have a detached SFR, you enjoy more privacy because you share no walls. Your utility bills are your own — you pay only for what you use. Outside of the planned developments, you’ll have no community rules or committees. Within the limits of zoning and local laws, you can rent the basement overnight, play music, fix your car, park an RV, and have pets. Borrowers who seek to finance and refinance single-family homes have an advantage. If you finance a fee simple property, the process is fairly straightforward. Appraise the home, check the applicant’s credit and income, and off we go. Without a homeowners association to evaluate, mortgage approval is faster and easier. Plus, your debt-to-income ratios are lower without HOA dues. With condos or planned-unit developments, the lender has to be familiar with the condo documents and finances. Reviews can be very extensive, crawling all over the project’s books, types of ownership, HOA meeting dues, pending litigation, and marketability. That is most often the case with attached units. With detached homes in established condominiums or PUDs, according to Fannie Mae, “Project review is waived, with the exception of some basic requirements that may apply.” So approvals may be faster and easier to obtain. Finally, SFRs tend to appreciate in value more than condominiums or townhomes. Homeowners associations usually take care of all exterior repairs and maintenance (the things you don’t want to spend your money or your weekend doing). HOAs insure the public areas, and membership can buy you amenities you might not otherwise have — like a pool, gym, spa or gated security. Note that just because your single-family home is fee-simple doesn’t mean you have no rules. Many single-family homes are located in communities with homeowners associations (HOAs). These communities are usually referred to as “planned.” There may be an architectural committee which says you can’t paint the place red. You may pay monthly, quarterly or annual dues to a homeowner’s association. With no HOA, you’ll also be responsible for your own maintenance, and you’ll get to deal with the neighborhood nuisances yourself. Without an HOA, your next door neighbor, should he choose to, could wreck your view (or property value) with a few carefully-positioned ugly cars. Or an, ahem, unusual paint color. She might adopt six Rottweilers. Or start a punk band. The freedom you get with an unencumbered single-family home cuts both ways. Be prepared to tolerate. There are several differences between single-family homes, townhomes, condos and co-ops. Most of them have to do with legal ownership, rights and duties. But here are the most common differences according to legal site Nolo.com. Before committing to any property, including a single-family home, do your research. If you’re in a condo or planned community, your mortgage lender will likely vet the association. But you’ll want to make sure their Covenants, Conditions and Restrictions (CC&Rs) are reasonable, and that there is no HOA drama. Check out the minutes from the last meeting and all the rules before committing. If you’re not in a planned community with CC&Rs, check out your neighbors before buying. With no HOA to make your neighbor garage his giant RV or his “interesting” junk sculpture, make sure you’re okay with looking at it all day, every day. Can you afford a single-family mortgage? All else being equal, a single-family residence is usually more expensive than a comparable condominium or townhome. So can you afford the mortgage on an SFR? Fannie Mae and Freddie Mac do charge more for some loans when the property securing them is a condo, manufactured home or multi-unit dwelling. You have to pay a surcharge (usually .5 to 1 point) or accept a higher interest rate. In addition, mortgage lenders count the HOA dues in the mortgage applicant’s debt-to-income ratios. So condos can actually be harder to finance, even if they cost less. 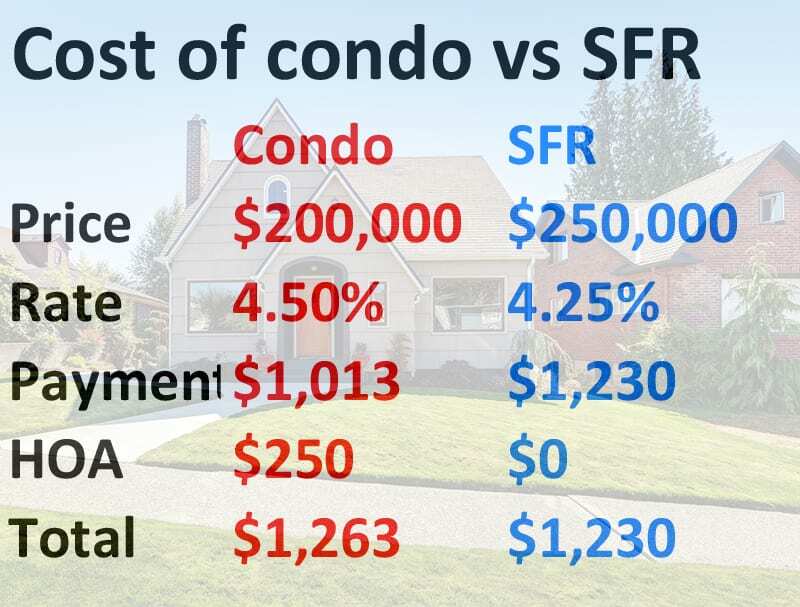 Check out the comparison below showing a $200,000 condo cost vs a $250,000 SFR. One of the key measures lenders examine when looking at a mortgage application is the debt-to-income ratio (DTI). They want to make sure that borrowers can easily make their mortgage payments. The DTI generally has two components. First, the “front” or “top” ratio compares monthly housing costs to gross monthly (before tax) income. Second, the “back” or “bottom” ratio measures the percent of income devoted to housing costs as well as recurring monthly expenses like auto payments, student loans, and credit card bills. FHA generally limits the front ratio to 31 percent. The maximum back ratio is 43 percent (in most cases). This is usually expressed as 31/43. Other mortgage programs can have different DTI limits. And if you have stellar credit and don’t carry much debt, lenders may bend the rules a little. For a single-family home, the lender counts the mortgage principal, interest, property taxes, and property insurance ( the PITI payment). However, for a property which is part of a homeowners association, condo, or co-op, the lender will add monthly fees and charges to the DTI calculations. Why are such fees important to lenders? Because if condo, HOA or co-op fees are unpaid, the property can be foreclosed. What this means is that a borrower who might qualify for a single-family house may not be able to get financing for a condo or co-op. Be careful, however. Maintenance and repair charges for the new house may eat up the HOA dues savings. So even though the lender doesn’t count these potential costs, you should. Estimate 1 percent of your home value each year for that stuff. Divide by 12 and put that money away each month to save for these costs. Because if the HOA isn’t taking care of your fences, roof and external walls, you will be. The savings on HOA dues may not be enough to help you qualify for aanSFR where detached houses cost more. However, there are ways of making it more affordable. Fannie Mae’s HomeReady® program allows buyers to purchase with as little as 3 percent down and use income from a boarder or roommate. The boarder can contribute up to 30 percent of the required monthly income. You must prove that you have lived with your roommate for at least 12 months, and have rent payment documentation for at least nine of those months. You can also use HomeReady® to purchase an SFR with extra room to rent out — perhaps a basement apartment, a small guest house or an attic addition. The rental income (documented either by an appraisal or a current lease) counts in your debt-to-income ratios. Other tried-and-true methods include buying with a co-borrower, buying a tiny house, buying in a “revitalization area,” applying for down payment assistance, or qualifying for special products like zero-down VA or USDA home loans. If you’re a teacher or first-responder purchasing through the “Good Neighbor Next Door” program, for example, you could get a 50 percent discount on the property. The bottom line is that single-family homes can be less expensive to own than other residences. And there are creative ways to reduce the cost. So if you, like most Americans, prefer a single-family home, you should go for it.